This project was formed on 2014, with the mission to give support the andean local families in the andes of Peru. 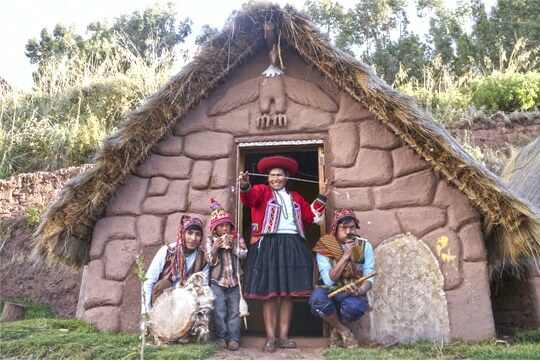 We start this project in the rural Quechua community of Huchuy Qosqo with a very humble family, we work together with Irene Sallo, the head of the family, a very enterprising woman. The founder Juan Carlos Auccapuma, a tourist guide, on one of his excursions passed through the house of this humble family to spend the night, there he met Irene. They had a dialogue for hours, where Irene explained that there are some travelers arriving to the house, but they had none the minimum idea of how to provide services to foreigners. With a mutual agreement with the family we start with this project. During this year we built rustic houses with the characteristics of the area that we called cabins. 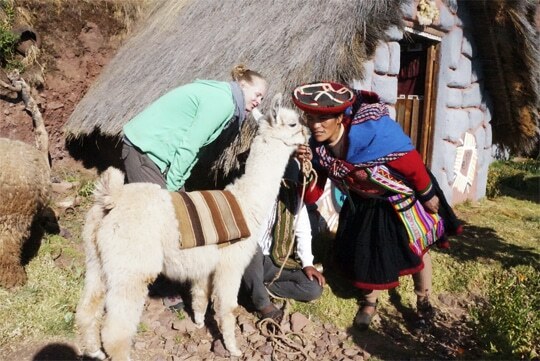 The founder created a program call Colours of Peru and this program is supported by Go Get Peru, taking travellers to the cabañas, for local living experience and homestay. On 2015 arrives our first travellers from Germany. Jessica Verstraelen and Matthias Hahne, a nice couple. They were very pleased with the experience and the service. The activities in the cabins are multiple, The family still keep the traditional agriculture of the area, they farm organic potatoes, barley, wheat,broad beans, corn, etc. They have some animals farming like guinea pig, sheep, llamas, cow and 4 horses to transport the crops after the harvest. Every Sunday the family goes down to the village of Lamay taking their crops to sell and then buy all the provisions for the whole week like oil, sugar, rice, noodles, fruits, etc. in Lamay town every Sunday there is a fair, where all the merchants gather to sell their products. 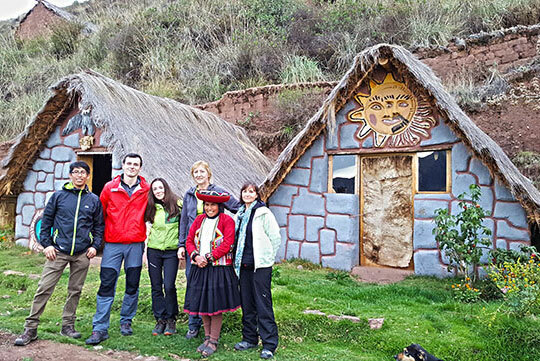 This project is growing now, they have more customers arriving frequently, also there are some travel agencies offering to their customers itineraries with homestay in Huchuy Qosqo, then continue to Machu Picchu. After finishing the designs in Huchuy Qosqo and having success, we decided continue with our second non profit project in Cupar Community, near to stunning lagoon call Piuray, that’s the way that we put the name of the cabañas Piuray. Colours of Peru, will never stop giving support to local families on the andes of Peru, now we will start soon with the third project in 4 Lagunas, in t’umi Community.